Gone are the days of balancing a too-small receiving blanket over the stroller hood in a desperate attempt to keep baby sleeping. Gone are the days of inadequate sun protection from too-small hoods. Gone are the days of struggling with too small or too bulky contraptions to keep strangers’ hands off your child. Outlook’s Shade-A-Babe is the solution. This stroller cover doesn’t just have a tiny peek window. It recognizes baby’s love for exploration and offers a full view while still protecting. The double layered mesh blocks at least 93% of UVA and UVB rays. It filters in a small amount of sun rays sot that your child can have a choice amount of Vitamin D.
The actual design is made to be super convenient. The front zips open for easy access. It features a pocket that you can fold the Shade A Babe into when it’s not in use. The hooks make it easy to install. 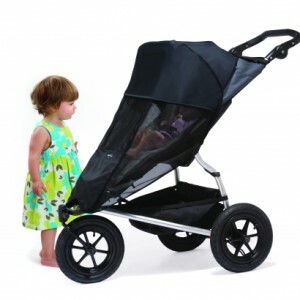 Plus, it’s designed to fit virtually any stroller, with both single and double models available. As you can see from the looong list of features above, the Shade A Babe is not “just another” stroller cover. It is fully featured and so well designed. It provides all the protection baby needs, and all the reassurance mom needs. It is definitely an essential for every mom. This is great — blocks 93% of UV Rays. I would really like to win this for my grandson so that he is protected from the sun. I would love to win this for my grandaughter. I would like to win for my daughter to help block the sun in her face. I’d love to win this because this would be great for summer and nap times in the stroller! I would love to win this for my 15 month old daughter. She is growing like a weed and I like that yours is guaranteed fit and up to age 4. !! Also, the extra UV protection is an awesome bonus. Ty for this amazing opportunity. Id like this because it fits any stroller, and not only that it would keep my daughter protected from the sun while taking her for walks or being at the fair where your out in direct sunlight the whole time. I’d love to win this for my son! He. Hates the sun in his face in the stroller and always makes me put a blanket over it this is an awesome stroller ! I’d love it!! I would love to have this for my daughter for when we go on walks/runs. I would like to win this to give to my best friend! Would love to win this for my godson, I think it would be great during this coming spring and summer in Georgia for them. Especially since they do like to do family activities, plus great use during family vacation time. I would like for my grandson. My daughter does a lot of walking and this would be great. I like that it blocks 93% of UV Rays. This is awesome!! I would love to win this because I always hated covering our son in sun screen even for the most shortest of walks or covering him up with a light blanket in which he would never keep on esp during windy days. I love hot it blocks out the UV rays but still able to give their Vit D for the day. I would love to win this so I can have one here because my grandson & wife just made me a great grandmother. A boy who is two months old now. By the time Spring comes around he’ll be just right for it and I can take him on walks & my tenth grandson was just born last May when he comes over. Woo Hoo!!! This looks like it would be so useful. I would love this to give to my niece for her little baby boy she could use it! I would love to win this as my grand daughter would be able to be protected from the hot prairie sun. I would love to win this for my sister – due in April.